Story by Adrian Down, Rainier Valley Greenways. For people biking in Rainier Valley, finding safe and direct routes can be a challenge. Answers to the question, “What’s the best way to get from Columbia City to downtown?” vary widely because right now, none of the options are great. 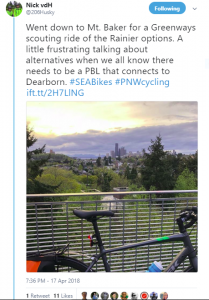 Rainier Avenue might be the flattest and most direct route, but the current street design is unsafe for people on bikes. Safer routes over Beacon Hill or north to Judkins add both considerable mileage and elevation. This challenge is at the heart of a current debate, as Seattle Department of Transportation redesigns Rainier Ave to create a new RapidRide bus line serving the Valley. 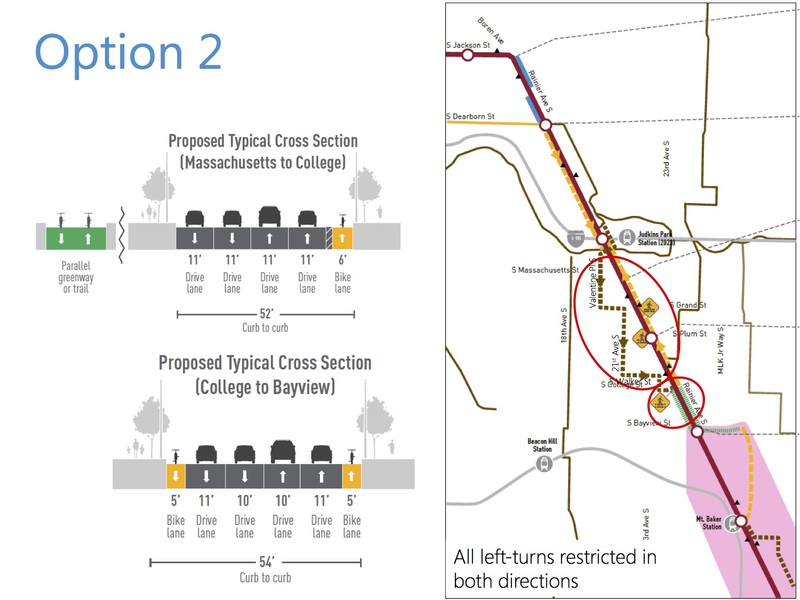 This line will replace Metro’s current Route 7, a well-used route that is a vital connection for many people in the South End. Seattle Department of Transportation’s proposal for Rainier Avenue improvements includes a few different options for bike routes running the length of Rainier Valley. 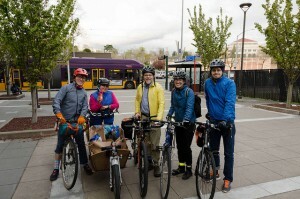 The three proposed options include routes connecting sections of protected bike lanes along Rainier Ave with sections of greenways and other infrastructure off the main Rainier Ave corridor, in varying configurations. 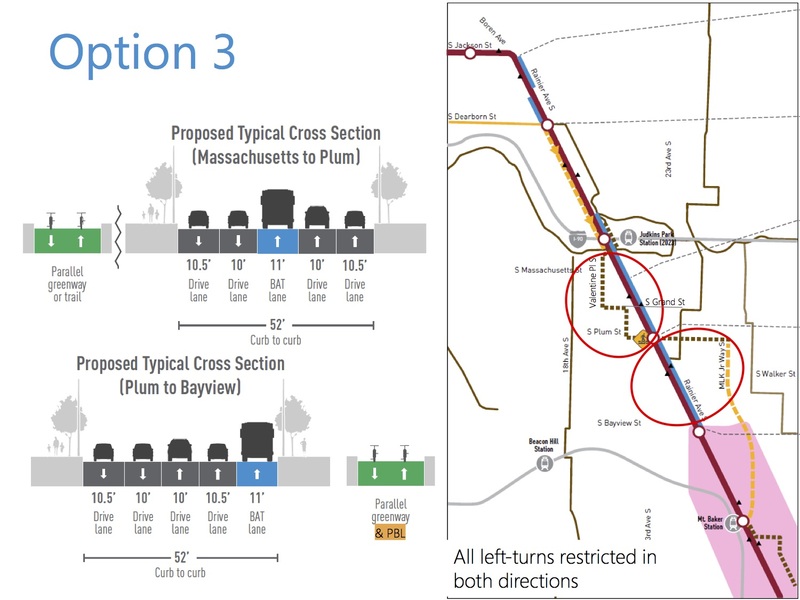 One of these proposed sections off Rainier connects from the Mount Baker light rail station (at Rainier Ave South and Martin Luther King Blvd) north to South Dearborn Street and the I-90 Trail. A group of nine Rainier Valley Greenways volunteers braved light afternoon rain and had a great time touring the three options for this section of the proposed bike route to provide on-the-ground feedback to SDOT. Our group consisted of multiple types of bikes and riders, including a cargo bike full of groceries, bikeshare bikes, and a family with a young child on a bike pulled by her parent—which gave us commentary from a spectrum of experiences. After riding the proposed routes going north from the light rail station towards South Dearborn Street and downtown, we compiled a list of observations and suggestions. The group ride started at Mount Baker Station at Rainier Avenue South and Martin Luther King Junior Way South. We found right away that improved crossings at Martin Luther King Junior Way South and Rainier Avenue are essential. This busy intersection is the gateway to a major transit hub (the Mount Baker light rail station) and requires preferential treatment for pedestrians and people on bikes trying to access the station. More sidewalk space for people waiting for the lights to change, curb cuts that face into crosswalks rather than into busy traffic lanes, and safe, intuitive infrastructure for bikes would be drastic improvements. 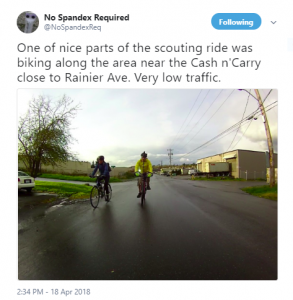 We rode north from Mount Baker Station on Martin Luther King Junior Way South, which currently has heavy, fast-moving car traffic and will require modification before it feels comfortable for people on bikes. We recommend fully protected bike lanes on this stretch of busy road. 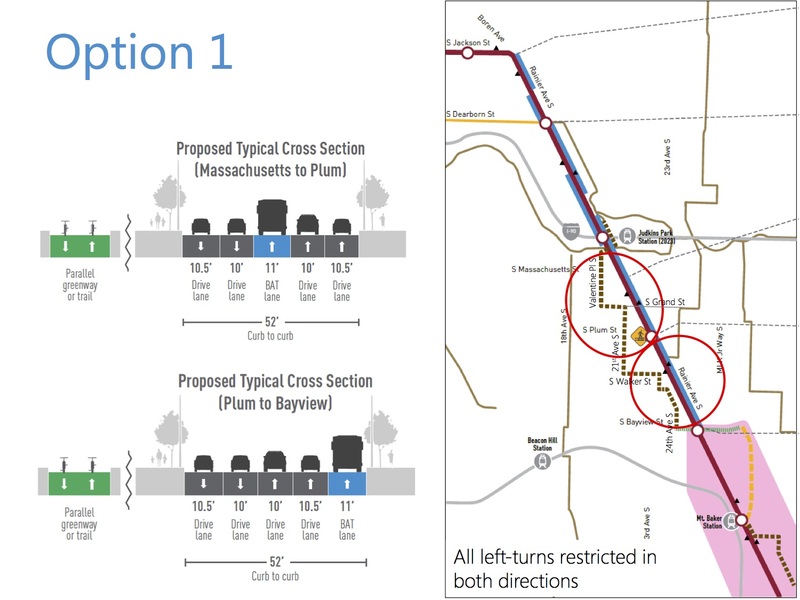 The first challenge for this proposed route is a left turn from Martin Luther King Junior Way South to get people on bikes onto back roads and eventually across Rainier Avenue. Of the two proposed route options, the South Bayview Street crossing of Rainier Avenue, seemed superior to crossing at South Plum Street, where we observed traffic backing up and blocking the intersections where South Plum Street crosses both 23rd Avenue South and Rainier Avenue. A protected intersection at South Bayview Street and Martin Luther King Junior Way South will be essential to help people on bikes make a left turn from MLK Jr Way across multiple lanes of traffic. This intersection will require crossing lights, markings, and traffic calming to be safe and comfortable for people to cross. South Bayview Street is a relatively quiet road, but its wide street design encourages high car speeds. A safer experience requires either protected bike lanes on both sides or a woonerf design that would both discourage cut-throughs and slow car drivers enough that the mixing of high bike traffic and infrequent cars is reasonable. While this route will need safety upgrades, our group was pleasantly surprised by the relatively flat terrain of the back roads that we toured in this area. Our group continued west along South Bayview Street and crossed Rainier Avenue. This intersection is critical. We recommend a full traffic light that provides plenty of time for a large group of people walking and biking to cross. Additionally, pedestrian improvements such as building curb cuts that face into the crosswalks, rather than diagonally into traffic lanes as they do now, and narrowing the entrance from South Bayview Street onto Rainier Avenue. We also suggest closing South Bayview Street on the West side of Rainier Avenue to cars. This would not restrict the access of vehicles to any businesses serviced by that intersection and would create a much safer route for people on bikes to travel and wait at the intersection. The route winds along side streets to the west of Rainier Avenue that are relatively quiet with low traffic volumes. However, they are wide industrial streets with several potential dangers. The current road design with wide lanes, sloping, gravel shoulders, and wide turning radiuses at intersections encourages cars and trucks to speed. The roads are scattered with gravel and industrial-area detritus, and multiple driveways and parking lots create conflict points. And the route is windy and confusing, directing people on bikes and on foot through an area that isn’t intuitive. We suggest that this whole route be treated as a mixed-use path. Intersections should include diverters or reduced widths and curve radiuses. It would be possible to keep routes accessible for trucks and other large vehicles by building low curbs that can be driven over. We would like to see sites with multiple entrances reduced as much as possible, and clearly defined where they are required. The route also needs ample signage and street markings to make wayfinding effortless, and clearly mark the road as a mixed use right of way. The lack of traffic is a plus of this route, and it could feel safe given these improvements. Finally, the entrance from this route to the I-90 trail has misaligned bollards and curb ramps. A wider, more accessible entrance would accommodate people on bikes, particularly those with cargo bikes, long frames, and trailers, and people in wheelchairs. SDOT’s proposed routes present plenty of design challenges, but we hope that by providing detailed input, we can help to make the final product as usable and comfortable as possible for all people on bikes and on foot. Group rides touring proposed routes are a fantastic way for neighbors to provide valuable, impactful feedback to SDOT and other planners. Being on the ground in these spaces, looking at intersections from a bicyclist or pedestrian viewpoint provides a user experience that is incredibly important to the success of the final project. Our group shared valuable local knowledge and feedback, built neighborhood connections and community, and had a great time. Thank you to all of our Rainier Valley Greenways volunteers for joining us and contributing their voices and viewpoints to this project. Inspired by this community-driven effort? Pitch in to help make more organizing like this possible.